Gathering tablecloths and shaking out crumbs. Washing the antique punch bowl and tiny, jewel-like glasses lent to me by a friend. Stacking gold chairs covered in soft, white cushions. Sweeping floors, vacuuming rugs, wiping counters clean. And gratitude for an evening wrapped in magic. Last night Michael and I hosted a Downton Abbey dinner in honor of a woman whose commitment to service makes me weak at the knees. Her name is Linda Cruse and she’s the founder of WandAid.org, an organization that provides emotional and economic empowerment to victims of natural disasters. Tomorrow morning at 7am, Linda will fly to Nepal to arrange for cows, goats, chickens, and shelter to be provided for forgotten families who survived the earthquakes in April and May of 2015. Over the years, she’s arranged similar help for families in Pakistan, Thailand, the Philippines, and Tibet. People who know her say she’s a cross between Florence Nightingale and Indiana Jones and I now understand why. This woman sheds light on some of the darkest places on earth. You can read all about her work here. 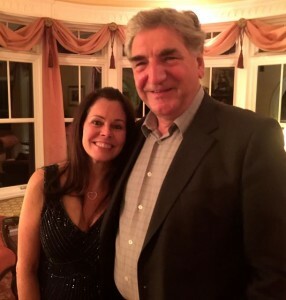 Last night she came to dinner with her good friend, Jim Carter, the actor who plays Carson, the butler, on Downton Abbey. Jim is intimately involved with Linda’s foundation and we spent the evening with fourteen generous souls who agreed to help fund Linda’s work. I don’t know about you, but I’m a huge fan of Downton Abbey. I love the writing, the clothes, the story lines, the characters, Highclere Castle, the music, etc. It was a surreal experience to look up and see Carson at the end of our dining room table smiling and laughing with our guests. He’s a prince – a gentle giant who’s deeply committed to using his prominence for good in the world. Hearing behind-the-scenes stories about Downton Abbey was fun for sure, but what really made the evening special was watching our diverse group of family and friends unite in their desire to help this remarkable woman care for the families she’s come to know and love in Nepal. I kept thinking: This is a night to remember. This is why we’re here, to experience life, to feel love and give love and revel in the beauty of our shared humanity. So this morning, as I wash and dry dishes, stack chairs, and clean tables, I see each chore as a blessing. A chance to keep my hands busy while my heart feels such gratitude for this new stage of life when I’m able to be present for people, and more focused on giving back than getting. Here’s a video of Linda giving a short talk at a Unity Church. You can watch her here.